Elegance meets beauty with this sophisticated custom ranch built in 2015. 14-22ft soaring ceilings throughout. Custom tile floors on main. An architects dream with curves & wood detail around every corner. Foyer opens to formal living w/ floor to ceiling built ins. 14 person dining rm w/ coffered ceilings & cabinets. Sprawling kitchen w/ stone counters great for entertaining & opens to breakfast area, family room w/ built in entertainment center & Second kitchen. 5 bedrooms/5 baths on main including 4 ensuites w/ walk in closets and full baths. Master suite with sitting area, 3 walk in closets, custom cabinets, walk in shower, soaking tub. Finished basement w/ theatre, great room, bar, half bath, 2 bedrooms w/ Carrera marble bath. 3 car drive through garage. 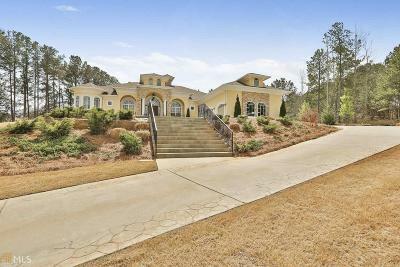 Directions: From Intersection Hwy 74 And Hwy 54 In Peachtree City, Travel East On Hwy 54, Right Carriage Lane, Enter Hyde Park Subdivision, Home Is Located On The Right Side Of Carriage Lane.